Description: He’s been VERY CRANKY, VERY ITCHY and now he’s VERY HUNGRY. Maybe it’s time to hook a deal with a lost polar bear…. Bear is back...and he''s very, very hungry! Bear is hungry! He''s trying to fish, but instead of food, he only manages to catch...a polar bear? The poor bear is lost and his ice floe is rapidly melting. The polar bear makes a deal - he''ll give Bear a pile of fish in return for a new home. Bear takes his new friend on a tour, and finally they find just the right home for a polar bear. Jake's Review: For a kiddie picture book, this one is pretty cool. The illustrations are really nice to look at and the story is pretty good. I think a lot of kids Jesse's age will really like this and I won't get bored when my parents make me read to the little midget. I think the author is trying to teach little kids about habitats at the same time which is pretty cool, cause it is not obvious like when teachers try to teach us stuff. I liked the cranky bear better because it was funnier, but this is pretty good too. 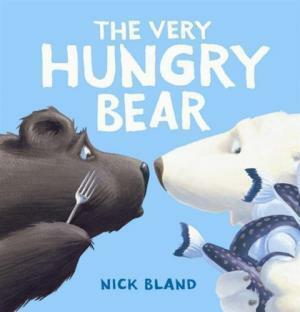 Mom's Review: How can you not love a Nick Bland book. The illustrations are truly delightful, the story charming and the rhyme engaging. I have a mad love for the Very Cranky Bear and while not as perfect as that, this is still marvelous. A nice moral included done in a non preachy way which is a true gift. Jesse grabbed this one out of my hand as soon as I opened the package and has made me read it to him every night since. So really that is all you need to know, my previously book hating toddler now loves the books - well as long as they are as cool as this one. Thanks Bland, I owe you one. 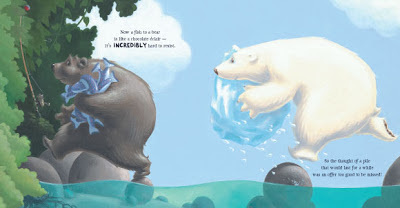 Now must pick up a copy of The Very Itchy Bear!